Tomes (toh-Mez) + Tomes (tohmz) = Tomes. This is the title and the theme of an unusual and thought-provoking exhibit at UNM's Zimmerman Library in the first-floor Frank Waters Room. On display through April 2019, the Tomes exhibit was curated by Lauri Gonzalez, MA, Latin American Studies 2018; Stephanie Beene, Assistant Professor, University Libraries; & Suzanne Schadl, Associate Professor, University Libraries. All three curators have close connections to the UNM Latin American and Iberian Institute (LAII), be they alumni or affiliated faculty, and demonstrate the dynamic richness of the extensive Latin American community here at the university. The exhibit is accessible to the UNM campus and broader Albuquerque community during Zimmerman Library's normal operating hours. It is also the topic of a forthcoming article, "Tomes! Enhancing Community and Embracing Diversity Through Book Arts," authored by the curators for publication in Radical Teacher: A Socialist, Feminist, and Anti-Racist Journal on the Theory and Practice of Teaching, 112 (Fall 2018). As the curators discuss in the article, this exhibit highlights important connections between the spoken word, handmade paper, cultural memory, and natural sustenance—in both books and in artworks. The projects displayed in the exhibition slide back and forth between two worlds: books and artworks; pre-colonial and contemporary; English and Spanish, with a dusting of Mayan and Mexica languages. “Tomes (toh-Mez) + Tomes (tohmz) = Tomes” (“Tomes”) brings together two projects that highlight Mexican artists’ books as documents, brought to life in communities through performance. The English plural for scholarly books, tomes, is pronounced tohmz, and indicates weighty volumes of knowledge. In Spanish this combination of letters means something entirely different. As a conjugation, it is pronounced toh-Mez and means “you eat,” “you drink,” or “you take,” depending on the context. Written with no context, the signification is the same. Once spoken and heard, however, the word is remarkably different, depending on whether someone is a Spanish- or English-language speaker (or both). The title of the exhibit plays with Spanish and English for the distinct purpose of highlighting the prospective disconnect between at least two of the audiences The University of New Mexico libraries and archives serve. Likewise, the themes referenced in the title of the exhibit—scholarly books and consuming food and drink—are equally significant because of their prevalence in the works displayed. One side of the exhibit displays a series of contemporary codex-like tomes from an indigenous collective in southern Mexico, with a facsimile of the Codex of Tlatelolco (1994) as its backdrop. 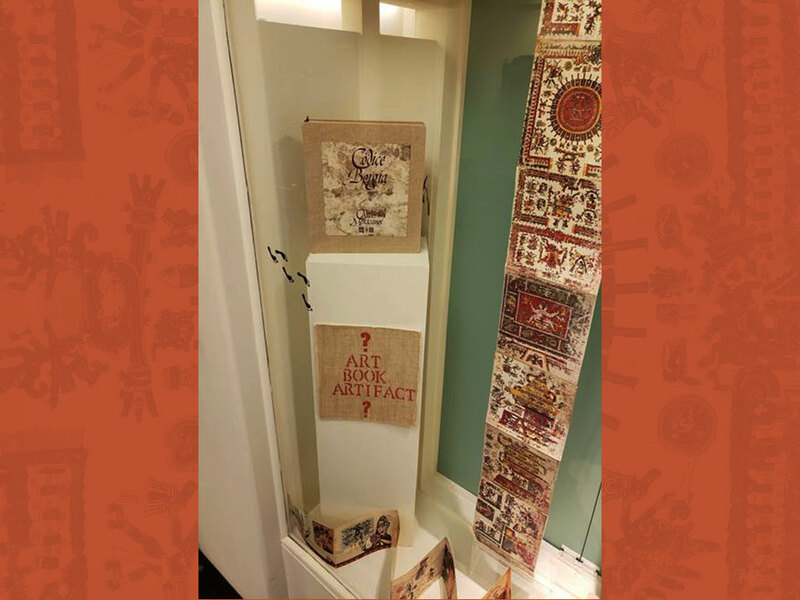 Indigenous paper- and dye-making practices connect the books, while certain display cases invite sensory interaction so that visitors can experience components of codex production: items like lavender, sage, leather, twine, and more are in an open cases for audiences to touch and smell. On the other side of the exhibit, five Mexican artists’ books and portfolios, made to look like food or drink, or made with the implements of food and drink, like a soup bowl, soup spoon, or actual bottles of mescal, are displayed to provoke visitor response and interaction in much the same way that communities interacted with them over a series of diverse community outreach events throughout 2017-2018 across the UNM campus and beyond. Both sides of the exhibition invite interaction with multimodal, multisensory pieces that were created in and for communities. A challenge of this exhibit was to create an interactive experience that honors the communal interactivity of both projects, in a classroom and meeting space designed for more passive and individual experiences. How can we, as educators, librarians, archivists, and curators, incorporate a multiplicity of voices, doing justice to the ways objects’ meanings change depending on the cultural experiences of those viewing and interacting with them? Instead of viewing rarified collections as dusty wares to be carefully preserved, how might we, as stewards of communal spaces and artworks, provide better access and outreach so that communities can interact with pieces that richly symbolize their homes, their traditions, their native languages, and their families? Many universities, museums, libraries, and archives write mission statements that speak to multiculturalism, inclusion, and diversity, but words on the page mean little without context. How do we leverage these noble goals into performing better outreach and engagement with our communities and their collections that are entrusted to us? The exhibit continues to evolve according to community feedback. Inclusive practices require empowering marginalized communities to come to the center and take a leading role in curation, education, and description— authoritative processes that are typically internal rather than external. As they brainstorm the creation of a virtual exhibit that will live alongside and complement the in-person exhibit, they have again realized the excellent opportunities that emerge and re-emerge for educators, librarians, and archivists to critically engage the questions raised by these objects, the cultures that produced them, and what occurs when they are re-presented for others.